One reality about farming is that the work is never really done. Even in the dead of winter, with glistening fields of glowing white as far as the eye can see, with frigid temperatures that would make a Siberian husky cringe, when we couldn’t be further from thinking about green growing plants- we are. In addition to farming, I also work an 8-5 job as an agronomist at a chemical retail in my local town. It highlights the difference in life-styles quite well; I go to work in the morning, then I go home. Evenings, weekends and holidays are mine. When I go home, I leave my job behind. Farming is so very different. When I go home from work, I go to work again. During the winter months, sometimes that means I get on a semi truck to haul grain, sometimes I go to the shop to work on equipment, and sometimes I just go to the computer to work on numbers. Evenings, weekends and holidays are consumed by the myriad of farmwork that needs to be done. While friends and family busy themselves with other activities, like house renovations, video games, fishing, or a million other things, my focus, and the focus of other farmers everywhere, must remain on the farm. Christmas is no exception. 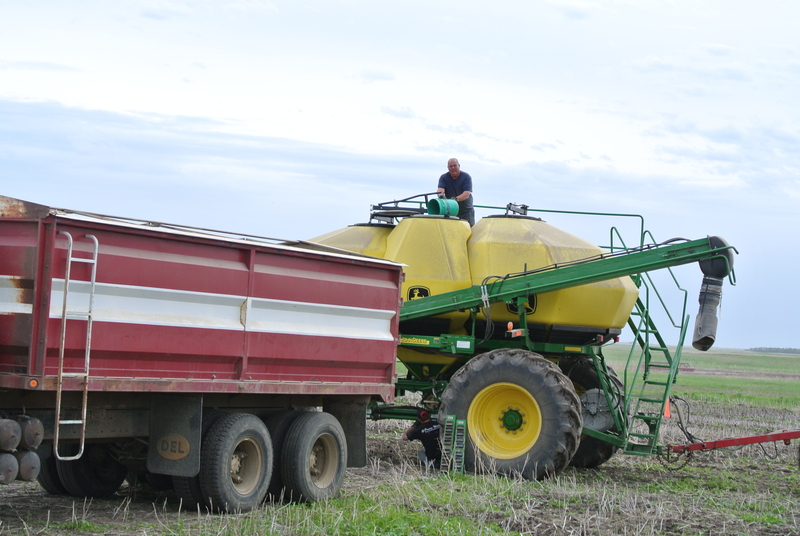 The week before Christmas, we were busy hauling soybeans and durum and working on one of our tractors. One thing about track tractors is that they do require more maintenance than their wheeled counterparts. 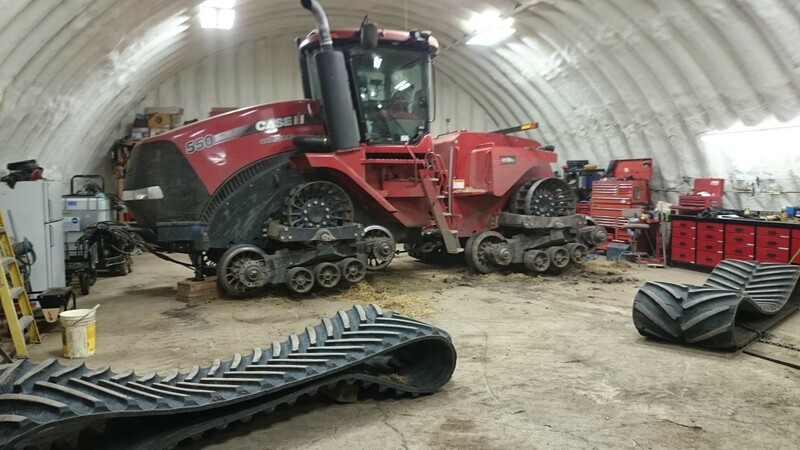 The tracks on one of our Case Quadtracs needed to be rotated, just like the tires on your car or truck- but they are not quite as easy to move around. We used the pallet forks on our little tractor to lift, drag and twist the tracks to get them off their wheels (yes, it was as difficult as it sounds). We pulled them off, changed oil in the idler wheels (bottom wheels in the picture) and then came the hard part- putting them back on. Remember, these tractors weigh in excess of 59,000 pounds and drag implements that weigh as much as a small house, with significant rolling resistance to boot; their tracks are heavy– and cumbersome. But, with the right tools and enough time (and enough sweat, blood and ugly words) we got the job done. At least it’s not a job that needs to be done very often. Besides all that, our farm’s year-end is December 31st, so we had a lot of documents to get to our accountant, preferably in an organized fashion. The end of the year is also a time to get seed bookings in to get the best discounts (where possible), so it’s important to at least have a basic idea of what to seed next year. Planning really never stops; there is a lot to consider as you try and figure out what to grow each year. Everything from the price of oil to nutrient levels in the soil has an impact on which crops will be most successful in the year ahead. With the ending of another calendar year, a lot of questions come to mind. What worked this year? What didn’t? What can we improve next year? Is there anything new that we should try out? At our regular farm meetings, we spend a lot of time discussing and dissecting the year that was, and what we can do better next year. With Christmas holidays, everyone is around, so it’s a great time to have these discussions. Even though the work never stops on the farm, sometimes, you have to find a way to leave it behind; sometimes, you have to realize that there is more to life than the farm. It is easy to let the farm consume you, and if you let it, it will. There is a never-ending list of jobs to get done, and never enough time to do them all. Even farmers take holidays, and, as much as we love the farm, we need them. My wife and I headed for Calgary to her sister’s farm, where we met with her entire immediate family, from Christmas Eve until the 28th. We will be having my side of the family’s Christmas on New Years Day. Christmas on the farm, whether it be here, north of Calgary, or anywhere else in this great nation, is a wonderful time; the freedom of the country is hard to beat. Sadly, Christmas of 2014 brought difficult times for our family, and for the farm. Don Court, my uncle and my mother’s brother, passed away suddenly on December 20th. He was 60 years old. He had been working on our farm since 2012 and was a skilled mechanic and equipment operator, not to mention he had a personality that we will sorely miss. It was a shock for all of us, and he leaves behind a loving family that will miss him terribly.